Monday noon, Pakistan was jolted by one of the most horrible earthquakes once again. Before in 2005 in same month we experienced one of the worst earthquake in history. According to media reports the death toll has risen to more than 175 around Pakistan. Along with that dozens of people have got injured in the earthquake affected areas. Expressing deep grief over the massive loss of lives due to the earthquake which jolted several areas of country on Monday, Pakistan Tehreek-e-Insaf Chairman Imran Khan directed for all out rescue and relief efforts to facilitate the victims and treatment for the injured. In an issued statement, he said that loss of precious lives due to earthquake was a national disaster and “we all need to join hands for rescue and relief activities sinking personal and political differences”. He directed the PTI-led Khyber Pakhtunkhwa government to remain vigilant and activate all departments concerned for conducting relief and rescue operation in the areas of the province that were affected most due to the quake. Thousands of frightened people rushed into the streets across Afghanistan, Pakistan and India as the quake rocked a swathe of the subcontinent. Shockwaves were felt in areas as far away as New Delhi in India and Kabul in Afghanistan. 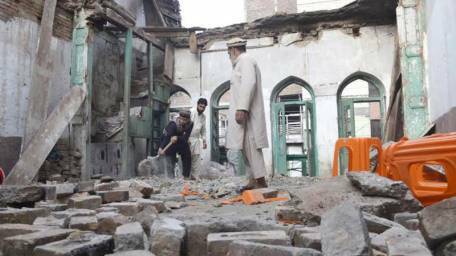 In Pakistan, the earthquake tremors were felt in Lahore, Islamabad, Sargodha, Peshawar, Malakand, Swat, Kashmir and several parts of the country. Several areas in Punjab and Khyber Pakhtunkhwa provinces were badly affected, with at least 186 casualties and hundreds of people reported injured in different parts of Pakistan. The earthquake was said to be one of the most powerful ever record in Pakistan's history. The US Geological Survey put the epicenter near Jurm in northeast Afghanistan, 250 kilometers (160 miles) from the capital Kabul and at a depth of 213.5 kilometers. The epicenter is just a few hundred kilometers from the site of a 7.6 magnitude quake that struck in October 2005, killing more than 75,000 people and displacing some 3.5 million more. While in north Afghanistan at least 12 of the school girls were victim of this stampede. They were crushed as they tried to get out of the building. Whole world is sad over this sad news.